My photographer friend was giving me feedback. Although many have the visual flair and skill to creatively depict highlights of the TTC’s rapid transit system, I’m not one of them. During the course of this journey, I’ve often wished I had a ‘real’ photographer tagging along to capture what I’m seeing. But that’s not going to happen. Instead, I find myself trying to document: what does this station look like for the ordinary person? What are its salient features? How does the space feel? What does a daily passenger see when they walk through it every day? What are the details they might overlook, but instantly recognize? Banality, repetition, the occasional foray into delight—that’s all part of the TTC experience. Summerhill is a healthy candidate for that treatment. As the loneliest station along the Yonge-University-Spadina line, Summerhill is an exceedingly modest stop, with no directly connecting bus routes. For most travellers, it’s ‘that station before St. Clair’ when you’re heading up to Eglinton. Peer up the tunnel (northwards), and you can descry the slope of the original open cut along the sides; the cut was subsequently roofed over. The slope of the original open cut may still be observed. 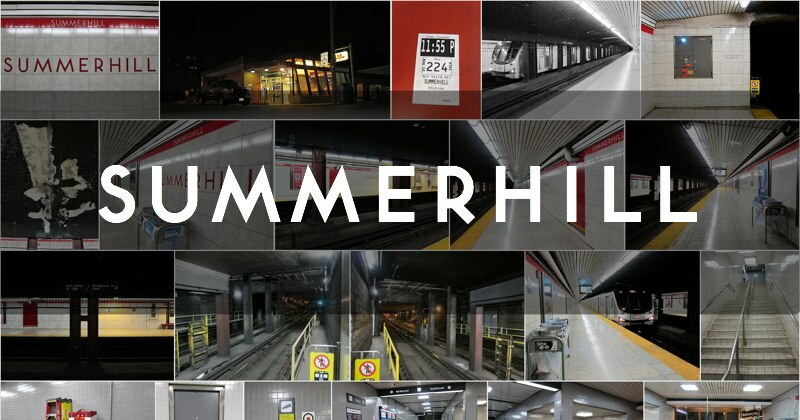 One of the original Yonge subway stations, Summerhill opened in 1954. It is compact, economical and perfect in its own way. Should you decide to explore the area, be sure to stop by the nearby LCBO—a gorgeous re-use and adaptation of the former Summerhill North Toronto rail station, constructed in 1916 and designed by Darling and Pearson. Bonus video: Midnight at Summerhill - Silent station.